_ School Closures When Oak Park District 97 Public Schools are closed for inclement weather, the Preschool will also be closed. Closures for weather or other emergency reasons may also occur at the Director's discretion; parents will be informed as early as possible by telephone or, when applicable, written notice. Illness Please keep your child at home and give us a call if he or she has had a fever within the previous 24 hours, a heavy nasal discharge and/or cough, has been unusually cranky (indicating the onset of an illness), or has symptoms of a communicable disease. The staff and your fellow parents thank you in advance for your courtesy in minimizing the spread of illness. Please inform the school if your child has come down with a contagious disease so that other parents can be advised to watch for symptoms. In the event that another child in the school contracts a communicable disease – we will notify all parents via writing and email communication. We follow the Oak Park Health Departments recommendations regarding illnesses. If a child has signs of illness while at school, the child will be separated from the group and the Director will call the parent or caregiver indicated on the Emergency form. He or she will be asked to pick up your child as soon as possible. The child will be stay in a safe, supervised, comfortable place at the school while waiting to be picked up. Late Fee Policy The Director and the teachers have professional and personal commitments during the lunch hour and after school. As a result, it is imperative that parents and other caregivers be on time to pick up their students. The Director understands that, on occasion, an emergency or other exigent circumstance will arise that prevents the caregiver from being on time. In such cases, wherever possible, a call to the Director, your class's room parent or another parent who can alert the Director to the situation is greatly appreciated. However, repeated instances of tardiness where there is no emergency is disrespectful to the GPS staff and upsetting to the child in question. Therefore, the GPS Board has determined that the third time that a parent or caregiver is more than five minutes late to pick up his or her child in a given school year, a late fee will be assessed of $1 per minute (after the 5 minute grace period). The late fee must be paid at pick-up and will go to reimburse the teacher that is staying with the child for her time. Please contact the Director with any questions regarding this. Nut Free Classroom Policy We recognize that food allergies can cause serious, life threatening conditions for some children. 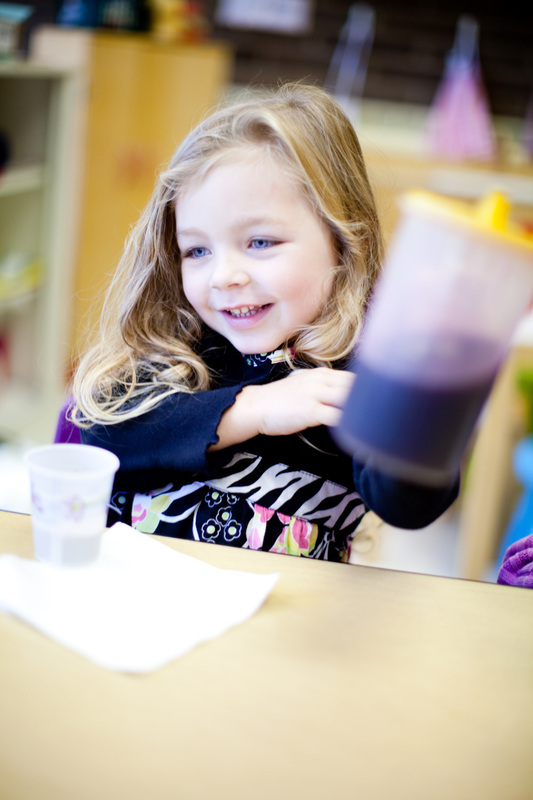 To keep all our children safe, the Glasser Preschool will aim to eliminate those foods that have been determined to cause allergic reactions in children. We cannot guarantee a completely nut-free environment since other activities and programs occur at Oak Park Temple within the preschool space outside of school hours. We will, however, maintain a no-nut environment in our classrooms during preschool hours. Glasser Preschool will provide the snacks served to the children in the classrooms. No snacks which contain nuts or indicate that they were manufactured in a plant using nuts will be served in the school. Under special circumstances (e.g. dietary restrictions or food allergies) parents may provide a snack for their own child(ren) if consistent with this policy (e.g. no nuts and not processed with nuts) and pre-approved by the Director. Others may provide store bought packaged treats on special occasions, such as birthdays or school parties, if consistent with this policy and pre-approved by the Director. Glasser Preschool will only use a lunch catering company with a nut-free kitchen for its school lunch program. Additional precautions will be taken in the classrooms to minimize the risk of incidental contact to nuts. Classroom materials not intended for consumption (e.g. art activities, sensory table materials, science and math materials, etc.) may not contain nuts or indicate that they were manufactured in a plant using nuts. The classroom tables will be wiped down with a bleach solution at the following times: prior to children arriving in the classroom, after any food is eaten by the children, and at the end of the classroom session. Children and staff must wash their hands upon arrival at school, before snack, and whatever other times are deemed necessary based on the activity performed. Staff should maintain awareness in the Oak Park Temple common areas for any nut issues during preschool hours. Failure of a staff member to comply with these precautions will result in progressive discipline up to and including dismissal. Education and awareness about allergies will be promoted within the preschool. All Glasser Preschool staff shall complete annual epi pen and allergy awareness training at the beginning of each school year. The completion of this training will be documented in their staff files. For the protection of the children, a list of children with allergies will be posted in each classroom. “No nuts” signs will be posted in each classroom. We will also send at least one letter home to parents providing allergy-related information and links to additional educational resources available on the internet (e.g., FAAN). Additional letters may be sent home to remind parents of this policy if necessary. Parents of a child with a food allergy must complete a Food Allergy Plan, which includes identification of the allergy, signs to watch for in case of reactions, and procedures to follow in case of reaction. Parents must meet with the teachers prior to the start of the school year to discuss the specifics of their child’s plan. A copy of the plan (signed by the parents, teachers, and physician where applicable) will be kept in the child’s classroom and in the student’s file in the Director’s office. Each student with a diagnosed food allergy must have a physician’s authorization for any medication to be administered to help counteract any possible allergic reactions. Parents must provide the medication, with its original label, to Glasser Preschool for administration to their child. Parental involvement, however, is still important. All parents should maintain awareness at after-hours or off-site preschool programs where parents are present, such as picnics and dinners, which are not covered by this policy. Policy: It is the policy of Glasser Preschool to implement and practice Integrated Pest Management (IPM) to control pests in buildings and minimize the exposure of students, faculty, and staff to pesticides. Illinois state law requires licensed childcare facilities to practice IPM indoors and to notify all parents and staff prior to pesticide application (See Notification). According to the law, if pesticides are applied, they may not be applied in the presence of children; toys and other items mouthed by children must be removed prior to spraying and children may not re-enter the treated area for at least two hours or as long as is stated on the product label. Pests: It is the policy of Glasser Preschool to control pests in the facility. Pests can pose hazards to human health, damage property, and disrupt learning. Pesticides: It is the policy of Glasser Preschool to minimize potential exposure to pesticides in the indoor environment. Exposure to pesticides can pose a health risk to students, staff, and others, which can be minimized by practicing IPM. Regularly scheduled applications of pesticides are not permitted under this IPM policy. IPM Coordinator: Marci Sperling Flynn, Director, is designated as the IPM Coordinator. She is responsible for overseeing pest control for the facility. Notification: If a pesticide application is deemed necessary by the IPM Coordinator, parents and staff will be notified in writing at least two business days and no more than thirty days prior to the pesticide application (antimicrobial agents and insecticide and rodenticide baits are exempt from notification). Contractors: Any contractor hired by the facility to provide pest control or other services must comply with this IPM and notification policy and should be knowledgeable about the IPM in Childcare Law (PA#93-0381) and use of IPM for structural pest control. Contractors must refrain from routine pesticide spraying, provide detailed service reports with each visit and give recommendations for pest prevention. Our Philosophy: Our philosophy at Glasser Preschool is to allow the child to solve his/her own problems with our guidance. We encourage taking turns, sharing and communicating. Physical or cruel verbal responses to conflicts are never appropriate. Education & Redirection: In the event that a child is having difficultly following the rules or is being disruptive in the classroom, the child will be redirected by a teacher to a more appropriate activity. If redirection is not effective, or if the child is exhibiting behavior that may be dangerous to himself or others, it may be necessary to remove the child from the group. Removal from the group shall not exceed one minute per year of age of the child. Every attempt is made to explain to a child in a positive and loving manner why his behavior is inappropriate. The teacher will usually discuss the issue with the parent(s) in an informal setting so the parent(s) may continue explaining the issue to the child at home. Parent Notification: If we feel the situation warrants it, the parent(s) are notified by a note or verbally told after class or in a phone conference on the day of the behavior problem. If necessary the child will be removed from the classroom and the parent will be called immediately. Progressive Discipline Procedures: At Glasser Preschool we take a team approach to addressing behavioral problems. The teachers, Director, and parents work together to find the best solution to behavioral problems that may arise at GPS. Conferences with regard to behavior problems: The parent(s) will be requested to have a conference with the teacher if the following occurs: (1) the child repeatedly refuses to follow the classroom rules; or (2) the child becomes physically or verbally violent and is threatening to the other children or the teacher. The Director will be made aware of any behavior problems in the classroom that are problematic to the operation of the class. If the parent(s) and the teacher need further assistance, the Director will meet with the teacher and the parent(s). Referrals: If the child=s behavior continues to be problematic, it will be recommended that the parent(s) seek outside help and the Director will provide a list of referral sources. Probation: The child will be placed on probation for an indeterminate time period until help is secured and/or the parents, the teacher and the Director agree that the behavior has been corrected and the child may return to school. Dismissal: The child will be dismissed from the school: (1) if the child=s behavior is continually disruptive and threatening to the well-being of the other children or (2) if the parents have not displayed documentation of securing help for the child when requested by the school. Director Involvement: The Director will be informed of any problems with the children attending GPS. The Director will be asked to observe any child exhibiting behavioral problems at GPS. The Director will be involved with the teacher and parent(s) from the beginning of conferences. The Director and the teacher will keep records of all events revolving around the child.